The Best Bookselves in the World! City Stacks Gift Cards come in a wide variety of denominations, and they can be used both online and in the bookstore. Click here to purchase your gift card. 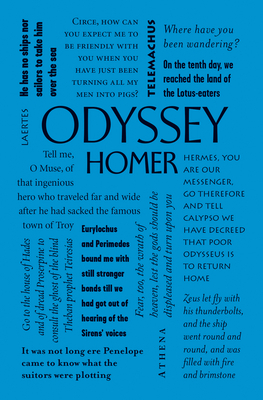 The epic story of Odysseus’ journey home. The story of Odysseus' perilous journey home after the fall of Troy relates allegorical tales of goddesses and sirens, capture and escape, and maneuvering between Scylla and Charybdis. After ten years of travel, Odysseus finally reaches Ithaca to find his family in turmoil. The saga of his efforts to make things right is one of the oldest works of Western literature, and still offers powerful lessons for modern times. Homer is a legendary ancient Greek poet, traditionally said to be the author of the two great epics of Greek history: the Iliad and the Odyssey. Both books are considered landmarks in human literature, and Homer is therefore often cited as the starting point of Western literary and historical tradition.